Full-text index of >450 journals on health care access and delivery, administration, financing and economics, planning, quality, reform, health services research, and public health. Map data from a wide variety of public sources on demographics, real estate, health, jobs and more in communities across the US. The GW Burns Law Library provides one workstation for non-Law students from the University, you can access the same legal databases as the law students using one workstation on the first floor of the Library across from the reference desk and requires a USB security key to activate that can be checked out at the Circulation Desk (desk that faces you as you come through the Library turnstiles). Patrons need to leave an ID at the Circulation Desk while the key is in use. 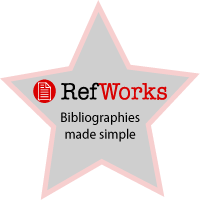 RefWorks is an online service used to create a personal database of bibliographic citations by importing the citations from other online databases. Citations may be automatically formatted for bibliography and footnotes and may be searched within your personal database. Looking for journal articles with associated data sets? New search filters in PubMed and PubMed Central (PMC) aim to increase the discoverability of articles and citations with associated data information. Users can search on or append searches with data[filter] to find citations with related data links in PubMed or other data repositories (e.g., figshare, Dryad). You can combine this with PubMed Medical Subject Headings (MeSH) for example "Nutritional Sciences"[Mesh] AND data[filter]. ​Use has associated data[filter] to find all articles with any type of associated data. Multi-disciplinary database with emphasis on scholarly publications and peer-reviewed journals. Full-text available for many titles. Continuously updated information on health policy legislation and regulations. Includes real-time news, information on rules and regulations, legislative tracking, and schedules of forums and events. Best practices, evidence based guidelines, and systematic reviews. Full-text of newspapers and business information. (Formerly GPO Access) Index to United States federal government publications that includes references to books, reports, studies, serials, maps, and other publications. Full-text links to many electronic publications; citations/abstracts to print publications. Inpatient, Ambulatory Care, and Emergency Department data at National & State level. Information about ongoing health services research and public health projects. Search by investigator, funding agency, or by keyword. highlighting successful public health projects that have been implemented around the United States. Political, social, and public policy database. Includes journal articles and information about websites, publications, and organizations. Coverage: 1972 - Present. Public policy research and analysis from think tanks, university research programs, research organizations, and publishers. Selected full-text links. (Formerly LexisNexis Congressional.) A comprehensive source of Congressional information including Congressional Research Service Reports, bills, hearings, testimonies, legislative histories. Web version of the MEDLINE database index of the medical journal literature. This GWU-specific link is different from the publicly accessible version, because most records should display a a full text link where the Himmelfarb Library has a subscription to that journal. For this reason readers are advised to click the link on this page (or from the Himmelfarb Library website) and DO NOT JUST GOOGLE PUBMED. Sort the list of articles you bring up in your results by the number of times they have been cited in other scientific papers! A useful quality filter for finding "highly cited" papers that match your keywords. search engine focusing on Latin American and Caribbean health sciences literature. Searches across multiple databases including LILACS, MEDLINE, Desastres, IBECS, PAHO, REPIDISCA, WHOLIS, CVSP, LIS, CUMED, Index Psicologia, BBO, DeCs, Coleciona, BDENF, Hanseniase, Homeoindex, HISA, Index Psicologia, CidSaude, and SOF. Search interface available in English and Spanish. Produced by The Latin American and Caribbean Center on Health Sciences Information (BIREME/PAHO/WHO).